Plays are often funniest when characters have no idea that anything they say or do is the least bit comic. 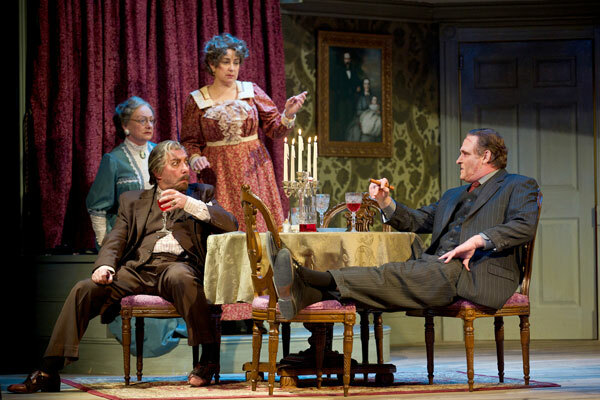 In Joseph Kesselring’s “Arsenic and Old Lace,” eccentricity in on the rampage. Two charitable, empathetic elderly sisters nurse to the needs of their entire Brooklyn community, delivering nourishing beef broth to those battling illness and relieving sad men’s loneliness by serving them home-made elderberry wine laced with three kinds of poison. Their three nephews are no less afflicted. One believes he is Theodore Roosevelt and is well-versed in the 26th President’s life and rituals. He never mounts a stair without yelling “Charge” and miming he’s pulling out a sword. The stairs, you understand, are San Juan Hill, and Teddy is on the attack. Another nephew is an easily irritated sociopath who, from childhood, enjoys hurting others and tends towards murder when angered. He is upset that he and his aunts have the same number of killings to their credit. The third nephew may be the most despicable of all. He is a theater critic. Have no fear though. As Abby, one of his aunts informs the neighboring minister, Mortimer, the critic, hates the theater and never says anything kind or favorable about it. The Brewsters go about their individual business in an orderly fashion. Neighbors adore them. The police are among their best friends. If it wasn’t for Teddy blowing his bugle at wee hours of the morning, the police would only visit his aunts to exchange pleasantries and enjoy their abounding benevolence. Best of all, except for Mortimer, the Brewsters have little if any idea they are any different from any other Brooklyn family. Teddy is content and harmless in the confines of his home. His antics do not bother, or even faze, his aunts. The criminal brother is more of a problem, but the aunts believe they can dispose of him….in a different way from how they dispose of many who cross their threshold. Because what could be classified as insanity goes on so matter-of-factly in the Brewster home, no one in- or outside of the family notices. Laughs comes as you learn of various household activities and from the routine ease in which all kinds of mayhem proceed in a casual, accepted manner, the aunts practicing euthanasia, Teddy digging locks in the Brewster basement for the Panama Canal, and Mortimer, the allegedly normal member of the family, heading off each evening to skewer some playwright’s illusions. It is the ordinariness the Brewsters convey and the conversational way in which they drop lines that become jokes that makes Charles Abbott’s production for the Walnut Street Theatre so satisfyingly delicious. Naturally, for there to be a play, everything has to come to head, and Kesselring cooks up the perfect storm when he brings home the criminal brother as a fugitive needing a hideout just when Teddy’s bugle blasts exhaust the tolerance of the police, and Mortimer discovers his aunts’ fatal brand of mercy. Oh, yes, Mortimer is also ready to propose marriage to the daughter of the minister next door, a young woman who is not quite as sheltered as her father may believe she is. In “Arsenic and Old Lace,” Kesselring has written a chestnut that stands all tests of time. When “Arsenic” opened in 1939, theaters burgeoned with attractions in spite of the Depression. Hundreds of new plays and musicals were produced each season, and people, sans television, flocked to them. Few of the plays from “Arsenic’s” period are revived today, but Kesselring’s neat little comedy with its unexpected one-liners, its sporadic comments on current events, and cast of vivid characters finds regular welcome. Abbott’s Walnut production demonstrates the reasons for its longevity and popularity. “Arsenic and Old Lace” is funny in an elemental way that makes it entertaining to succeeding generations. Craft and wit combine to make a piece that grows in comic intensity as it proceeds. Abbott and most of his Walnut cast get the most from Kesselring’s invention and humor by playing as if the Brewster home was no different from any other and that what happened there is as ordinary as in most American domiciles. Even Dan Olmstead, as the psychotic brother, and Laurent Giroux, as the discredited doctor who assists him in his villainy, resist playing types. If Jonathan, the sociopath, is quick to strangle someone who happens to mention he resembles Boris Karloff (the actor who originated the part of Jonathan in 1939), his reaction takes the form of natural reflexive anger. We, the audience, read the comedy into the situation, which is the way a wise theater piece should play. If Giroux, as the nervous, observant Einstein, gets a little excited around the police or reluctant acquiescent to Jonathan, the actor plays the scene in stride. Yes, Giroux has some comic shtick but it is in keeping with Einstein’s anxiety. Abbott’s production plays like canny clockwork with Mary Martello and Jane Ridley, as the Brewster sisters being quite sensible as they talk about and impose the standards they retain from the late 19th century while they nonchalantly help others from having to wait to end lives that seem to have lost their spark years before. Martello’s Abby is the warm aunt, the leader and the planner, who has a sentimental touch but likes her household to run just so. Ridley’s Martha is the more teacherlike sister who likes to help everyone in any way she can. Their funniest lines usually come as they are explaining one of their principles or speaking wistfully about a trait of one of the gentleman to whom they have given succor as well as last rites. The Brewster sisters are careful to find out the religious affiliation on the recipients of their pity before they serve them the laced wine. Individually, and as a team, Martello and Ridley are the models of sweet and properly-raised ladies, now old and hoping to keep Teddy happy at home and Mortimer settled before they meet their unaided demises. Martello has some wonderful scenes with the minister and police officers. She also shows proper sternness when dealing with Jonathan, striking the right combination of fear and firmness. Ridley is a constant dear, not as emotional or fluttery as Martello, but equally resolute about her nephews and the old men who are in such dire need of assistance. Martello and Ridley set the tone for Abbott’s production, but you can tell the director cautioned everyone to be relatively low key and let Kesselring’s lines and plot do the heavy lifting. “Relatively” is the operative word in the last sentence. When you are dealing with man who thinks he’s Teddy Roosevelt and an actor who has to parody Teddy Roosevelt, there is bound to be much that can’t be classified as “everyday.” Ben Dibble affects the booming voice and adds emphasis when Kesselring gives him a “bully!” or “deee-lighted” to bellow, but in essence, he plays Teddy Brewster in a way that convinces that the young man has no doubt he is T.R. and that is always consistent. Dibble’s is a Teddy that is as inured to his habits as anyone might be. It’s just that his habit is living as if he was a bygone President, one that would be remembered by most audiences in 1939 and one that is ripe for such lampooning. Dibble’s Teddy is not a madman playing at being T.R., he is a deluded man who has adopted T.R.’s ways and sticks to them, consulting his cabinet before making a decision and considering it his duty to dispose of yellow fever victims in the locks his aunts ask him to build to accommodate the Panama Canal. You may wish Dibble’s Teddy had fewer occasions to run upstairs yelling “Charge,” but in the long run, Dibble gives a strong comic portrait of a man who lives wholeheartedly, and wholemindedly, as someone else. Dan Olmstead is another who fits into his eccentric character as if his way of behaving is the only way to behave. The lurchlike lope Olmstead gives Jonathan seems in keeping with his reptilian creepiness. Jonathan is in the habit of changing his face every time the police come too near to capturing him. He’s been across Europe, Asia, and the U.S. with more pusses than Lon Chaney. His partner in crime, Einstein, is a plastic surgeon who, in a bout of drunkenness, gave Jonathan the face of Boris Karloff. Einstein says it was the picture in his mind at the time of the operation. As such, Jonathan is confused with Karloff, a circumstance that has driven him to kill more than once. Olmstead is great at simply being surly and sarcastic. Kesselring has armed him with the lines and character he needs. Olmstead takes advantage by being the same brat his aunts remember from his childhood, when he used to enjoy experimenting in his father’s laboratory. It seems the Brewster patriarch was a kind of Paracelsus who, for the sake of research, often undertook medical procedures that may not have been approved by authorities of his time. Laurent Giroux is deliciously entertaining as Einstein. He is such a good comic coward, one who knows the difference between right and wrong but doesn’t care which he does, and one who is wary of the aunts’ goodness, Mortimer’s threats, the regular visits by the police, and Jonathan’s temper. Giroux is a nervous wreck who nonetheless spouts a lot of reason. He doesn’t follow his reason, but he spouts it. Damon Bonetti and Jennie Eisenhower have the thankless task of being the ‘normal’ folks among the eccentric. Eisenhower’s Elaine is tantamount to a conventional visitor to the Addams manse or the date Marilyn Munster brings home to meet the folks. Eisenhower gives some oomph to Elaine. While she can easily settle into being the proper lady, Eisenhower shows that Elaine has a libido and enjoys going against her father’s ministerial teachings when the moon is low. Hers is a good performance because it expands the character and makes her into an individual instead of the functional role she could be. Bonetti is the most animated of the Brewsters. While Martello and Ridley, and especially Dibble and Olmstead, stay within their characters, Bonetti at times makes Mortimer outsized. He does sitcom takes when he learns of his aunts’ murderous practices, he dances away too quickly when he realizes he’s sitting above where a corpse is hidden or on a chair where one of his aunts’ unsuspecting victims sat a few hours previously. Given that Mortimer is the reasonable Brewster, the one without tics or traits that would make others consider him crazy, if they only knew, you’d think Bonetti would be the most suave and subtle in his responses. His Mortimer, who is both a hardbitten reporter and a vindictive theater critic, would be more sophisticated, more like Bud Abbott and less like Lou Costello in a tense situation. Bonetti opts for Costello. As Mortimer’s characters turns from one who is constantly making unwelcome discoveries to one who has problems to solve, Bonettl’s performance calms, and he becomes the more assured, less Curly Howardish Mortimer he appeared to be in his earlier scenes. John-Charles Kelly has a great time playing a policeman who is more intent on telling Mortimer a plot he has for a play than he is at observing the various criminal activities taking place around him. Kelly, like several of his castmates, gives his performance a nice ’40s feel. Fran Prisco and John Jarboe are congenial as the beat cops who check in with the Brewster aunts a few times each day. Paul L. Nolan is respectable in an appropriately oily way as the minister who sees the Brewster sisters more in terms of bequeathed stained glass windows than as neighbors or the aunts of his daughter’s intended groom. He is perfect as the temperamental police lieutenant who is constantly surprised at all that has been happening in his precinct and comes to restore order. The 19th century gingerbread mansion Robert Klinghoffer designs for the Brewsters is a visual delight, as warm, comfortable, and cozily old-fashioned as you would expect A bby and Martha to maintain. Colleen Grady has obvious fun with the everyday dresses and mourning weeds of the aunts. Shon Causer’s lighting helps with the tension and mystery Kesselring weaves amid his comedy. Thunks and squeaks from Jacob Mishler’s sound design also adds to the tone of the production. The Walnut production of “Arsenic and Old Lace” is both wise and hilarious. It not only serves Kesselring’s warhorse. It shows the play has a lot of life and energy in it yet. I particularly enjoyed Kesselring making the aunts and Jonathan competitive about their kill totals and the aunts’ indignation about a victim of Jonathan’s who is stashed in the Panama Canal locks. ‘Arsenic and Old Lace” runs through Sunday, April 27 at the Walnut Street Theatre, 9th and Walnut Streets, in Philadelphia. Showtimes are8 p.m. Tuesday through Saturday, 2 p.m. Thursday (except for April 17), Saturday (except for March 29), and Sunday, and 7 p.m. Sunday (except for April 13 and 27). Tickets range from $85 to $10 and can be obtained by calling 215-574-3550 or 800-982-2787 or by going online to http://www.walnutstreettheatre.org. This entry was posted on March 26, 2014 by nzoren in Theater Reviews and tagged Arsenic and Old Lace, Ben Dibble, Charles Abbott, Classic, Comedy, Damon Bonetti, Dan Olmstead, Jane Ridley, Jennie Eisenhower, John-Charles Kelly, Joseph Kesselring, Mary Martello.